Compiled By: Good Radio Shows, Inc. These are popular specials to offer during the holidays when listeners are hearing the call for "Peace on Earth." These annual specials are evergreen - making no reference to the year's in which they were produced, so you can program several of these in a row to make a real peace celebration. Compelling highlights from Peace Talks Radio, the series on peacemaking and nonviolent conflict resolution. Conversations with leading thinkers and researchers in conflict resolution as well as with people working for peace, in their own varied ways, around the globe. A good program for anytime in the year, but especially good around the holidays when listeners are contemplating the senitment of "Peace on Earth." This is another in the ongoing series of compilations of compelling moments from the Peace Talks Radio series. Without referring to the year itself, this program samples episodes in the series that explored peacemaking efforts and conflict resolution thinking around the globe in 2010 (so it's esentially evergreen). Included is a look at the “Peace Through Music” project, and international efforts to protect human rights defenders in global conflict hot spots. Also conversations with leading thinkers in conflict resolution, like William Ury, Daniel Goleman and Rick Hanson. Plus highlights from a panel that explored how we can make peace with Mother Nature in the wake of 2010’s many environmental disasters. And listen in for the voices of school children to hear their thoughts on peacemaking. Lots more as well. The annual compendium of highlights from Peace Talks Radio, the series on peacemaking and nonviolent conflict resolution. Despite ongoing turmoil and conflict in our world, there are still people who are working for peace. Listen for the annual compendium of highlights from the Peace Talks Radio series on peacemaking and nonviolent conflict resolution. Listeners will hear about the Dalai Lama's commitment to peace, John Lennon and Yoko Ono's peace work, peace lessons from the annual Rainbow Gatherings and from international water negotiations. Other programs spolighting a community art project and an international pen pal project for peace will be recalled. Plus comments on peacebuilding through travel with Rick Steves, reduction of nuclear arsenals from Nobel Peace prize Laureate Dr. Bernard Lown and a word from Capt. James T. Kirk of the Starship Enterprise (really!). It's an uplifting and empowering hour. Listeners really do respond favorably to these shows. Stations wishing to run a 54:00 version, simply drop the "Optional Newscast" segment. There are 6 other compendium programs that were all narrated so as to be evergreen. If you'd like to add other episodes to your holiday celebration of peace and hope, or any time of year, you can also find them at PRX. Seeking Peace on Earth: The Peace Talks Radio Special reminds listeners that there ARE people who are actually pursuing peace and offering ideas how to reduce conflict in our lives. This program is a compendium of compelling moments from recent episodes of Peace Talks Radio. During the season when hopes for Peace on Earth are expressed, spend an hour hearing from people whose life's work is pursuing peace in different ways. A compendium of compelling moments from the Peace Talks Radio Series in 2007. During the season when hopes for Peace on Earth are expressed, spend an hour hearing from people whose life's work is pursuing peace in different ways. A compendium of compelling moments from the Peace Talks Radio Series in 2006. During the season when hopes for Peace on Earth are expressed, spend an hour hearing from people whose life's work is pursuing peace in different ways. A compendium of compelling moments from the Peace Talks Radio Series in 2005. During the season when hopes for Peace on Earth are expressed and resolutions for the New Year are made, spend an hour hearing from people whose life's work is pursuing peace in different ways. This compendium of compelling moments from the Peace Talks Radio Series in 2005 offers hope and ideas for listeners about how to bring more peace into their own lives and how to better understand the global search for peace. Listeners will hear from: - Yolanda King, daughter of the late Dr. Martin Luther King Jr., talking about the nonviolent legacy of her father. - Princeton University Professor Dr. Zia Mian on nuclear disarmament issues. - Parenting expert Ruth Beaglehole on how to raise children without resorting to physical or emotional violence. - Musician Steve Earle about his campaign to abolish the death penalty. - Mel Duncan, executive director of the Nonviolent Peaceforce at work in Sri Lanka. - Oren Lyons and John Mohawk on American Indian peacemaking traditions (this segment covered by stations running a newscast). - Teenage girls from all sides of the conflict in the Middle East talking about their fears and hopes at a summer Peace Camp. - And a bonus interview with President Jimmy Carter recorded in 2002. NEWSCAST COMPATIBLE Two 30 second breaks - at 00:20:00 (outq: when we return...) and at 00:37:00 (outq: after this break...) Most of the individual programs from which these excerpts were drawn are available at http://www.prx.org/series/5483. An all-new showcase of interviews with people whose life's work is resolving conflict peacefully in different environments. Good New Year's Weekend choice. A series of interviews with people whose life's work is resolving conflict peacefully in different environments. From the first season of Peace Talks Radio in 2003. Seeking Peace on Earth: The PEACE TALKS 2003 Special, is a collection of some of the most compelling segments from the monthly series PEACE TALKS, broadcast on public radio KUNM, in Albuquerque, New Mexico in the year 2003. Host Suzanne Kryder talks with people whose life's work is to resolve conflict peacefully in a variety of environments. Listeners will hear: -tips on raising children who are skilled in handling conflict and their emotions, -techniques that mediators use to help kids through those tough middle school years, -ways to develop inner peace in especially troubling times, -how language can transform a potential conflict into a resolution, -ideas for handling conflict in the workplace, -thoughts on improving race relations. Compelling and timeless moments drawn from just one of the many seasons of programs in the Peace Talks Radio series on peacemaking and non-violent conflict resolution. Topics include samples of three great Martin Luther King speeches, spotlights on Cesar Chavez, the Roosevelts, and a school clerk who helped foil a school shooting with her empathy. Some compelling and timeless moments drawn from just one of our many seasons of programs in the Peace Talks Radio series on peacemaking and non-violent conflict resolution. On the show, you’ll hear part of a conversation with the Atlanta school clerk, who by showing compassion and empathy, helped foil a potential school shooter’s plan to wreak havoc on an elementary school. Also some talk with historians who tell us about several peacemaking chapters in the stories of Teddy, Franklin and Eleanor Roosevelt. And we’ll hear from the woman who walked side by side with Cesar Chavez in the farm workers movement recalling his deep commitment to nonviolence. Also, finding peace with disability, raising boys to steer them away from violence and crime, conscientious objectors in the volunteer military, and a couple of top scholars of the life of Martin Luther King Jr pick three of his many inspirational speeches to look more deeply at. Hosted by series producer Paul Ingles with Carol Boss and Suzanne Kryder. Compelling moments from the series on peacemaking and nonviolent conflict resolution in the year 2013. The program features conversations about restorative justice programs, peace journalism, activism to prevent gun violence, a winning domestic violence prevention project, and the peacemaking roots of Mothers' Day. Also excerpts of our programs about Nelson Mandela, Peace Pilgrim and Sister Peggy O'Neill. And we'll recap our countdown of the Top Ten Peace Songs of all time. Paul Ingles hosts. Inspiring and engaging highlights from episodes of Peace Talks Radio, the series on peacemaking and nonviolent conflict resolution. Young women from opposing sides in the Middle East conflict come together to work for peace. A former West Point grad and Army captain puts the 'warrior ethos' to use in his post-service peace work. And a Republican and a Democrat agree on what to do to improve our political discourse. Much more. Paul Ingles hosts. Young women from opposing sides in the Middle East conflict come together to work for peace. A former West Point grad and Army captain puts the 'warrior ethos' to use in his post-service peace work. A Republican and a Democrat agree on what to do to improve our political discourse. A former Afghan ambassador talking about essentials of diplomacy. Practical and heart-felt ideas about finding peace around death and dying. How to become a Peace Ambassador. ... and more. 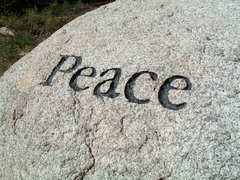 Compelling conversation excerpts from Peace Talks Radio shows on Nobel Peace Prize winners Martti Ahtisaari and Liu Xiaobo; heading off domestic and dating violence; Vietnam veterans finding peace by traveling back to Vietnam, an Alternatives to Violence program in prisons and more. Another in a series of Peace Talks Radio compilation specials. This one highlights programs aired in the series in 2011. You'll hear compelling conversation excerpts from shows on Nobel Peace Prize winners Martti Ahtisaari and Liu Xiaobo; heading off domestic and dating violence; Vietnam veterans finding peace by traveling back to Vietnam; an Alternatives to Violence program in prisons; The Global Peace Index and Imagining a Peace Economy; a conference on religious tolerance; and peace messages in classical music. This is an annual compendium of highlights from recent programs in the series but the language is evergreen making this or any of the other "Seeking Peace on Earth" yearly specials timely programming for the end of the year or any time. Our annual compendium of highlights from a season of PEACE TALKS RADIO, the series on peacemaking and nonviolent conflict resolution. This time listeners will hear highlights from programs about handling political stress, understanding and challenging hate speech, over population as a threat to peace, and more. Our annual compendium of highlights from a season of PEACE TALKS RADIO, the series on peacemaking and nonviolent conflict resolution. This time listeners will hear highlights from programs about handling political stress, understanding and challenging hate speech, over population as a threat to peace, how to find peace jobs, an author's visits to former U.S. military incursions, a CIA analyst's turn toward peace work, raising girls through challenges, and more. Other Playlists by Good Radio Shows, Inc.